@CapeCoddess wrote: Your tomatoes look mouthwatering, Yolos! I think I probably ate my last one of this year today. What kind of peas did you plant as a cover crop with the oats? Don't know. It was a combined cover crop package and the package only says field peas. Usually I only plant a bed of Winter Peas with no oats. The Winter peas are also called Austrian Peas (or something like that). They grow until it gets too cold then stop and start again in the spring. Austrian Winter Peas. Austrian Winter Peas are a good cover crop for producing nitrogen. These peas have better cold tolerance than Canadian Field Peas yet still grow well when planted after wheat or other summer annuals. It's preferred to plant them in August after the hottest days are normally past. I am a little late getting my fall compost pile built. 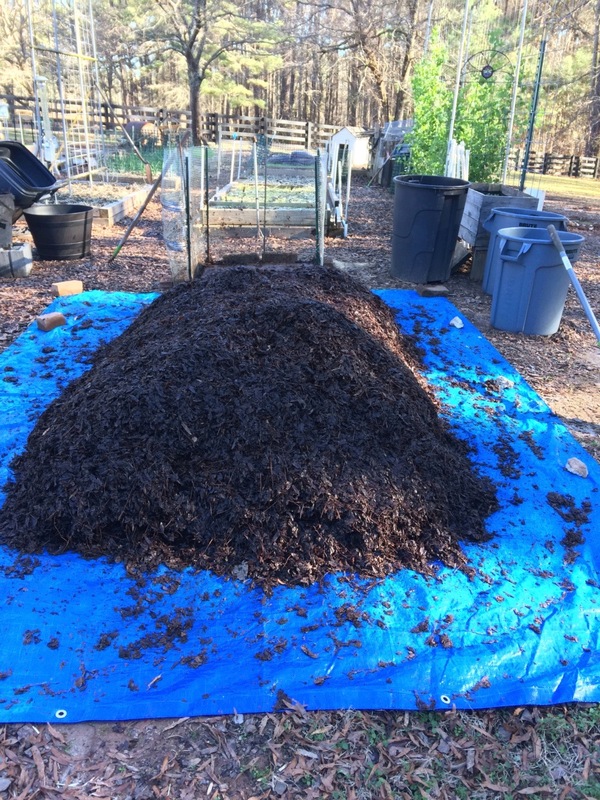 This is 360 gallons of shredded leaves (mostly Live Oak), 20 gallons of Starbucks used coffee grounds, and a couple gallons of old alfalfa pellets. It took me a week to collect all the leaves and shred them. Getting enough de-chlorinated water to hydrate the leaves was the biggest problem. I finished up today and the temp was 120*F. It started out to be 3' x 3' x 3'. But because the sides kept bulging it actually turned out to be a little larger. I have a few things growing but it is just too cold outside for me to enjoy tending to my garden. It was 37*F outside this morning when I went out to try to cover my compost pile. I had on a short sleeve T shirt, a long sleeve T shirt, a hoody, a heavy weight sweat shirt and a blue jean jacket and I was still cold. Some pictures of what is growing in my garden. These are my three corn beds that were invaded by the Southern Blight spores about 3 years ago. About the only thing that will tolerate this disease is Corn. So every year for the last three years I have grown corn during the summer and Mustard during the winter. The Mustard is supposed to kill the disease but who knows if it is working. 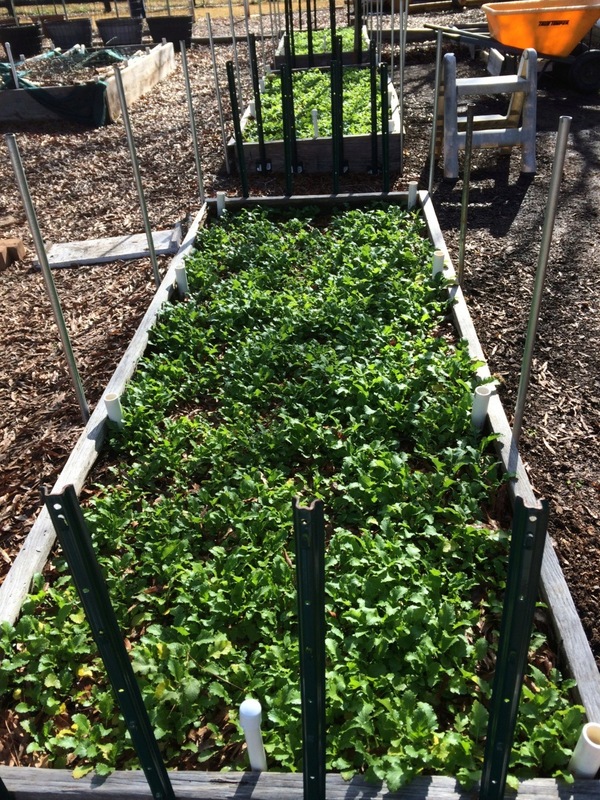 Another bed that has been dormant for the last three years and over the winter I am also growing Mustard in the bed. This will be my potato bed this year. I have already added a top hat to the 4 x 8 bed. 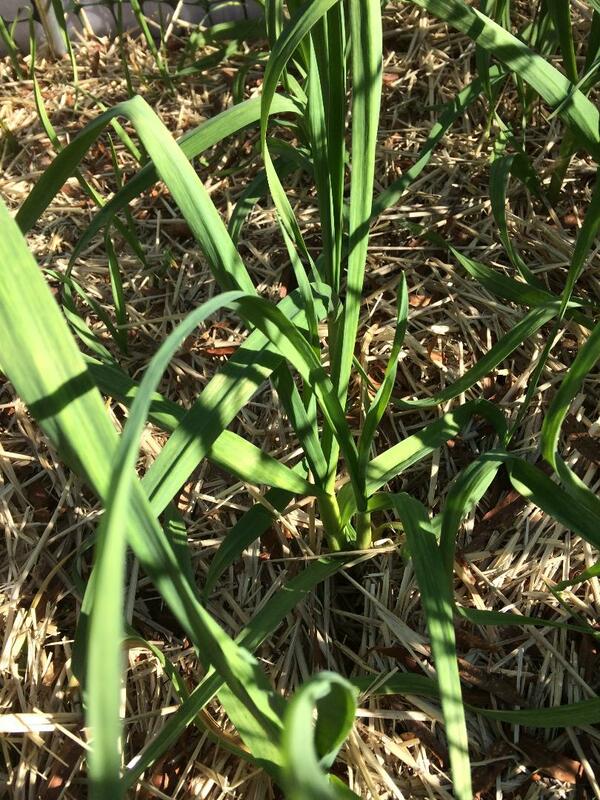 The cover crop is a mixture of oats and peas. it looks like I did not sow the seeds closely enough but it will do. 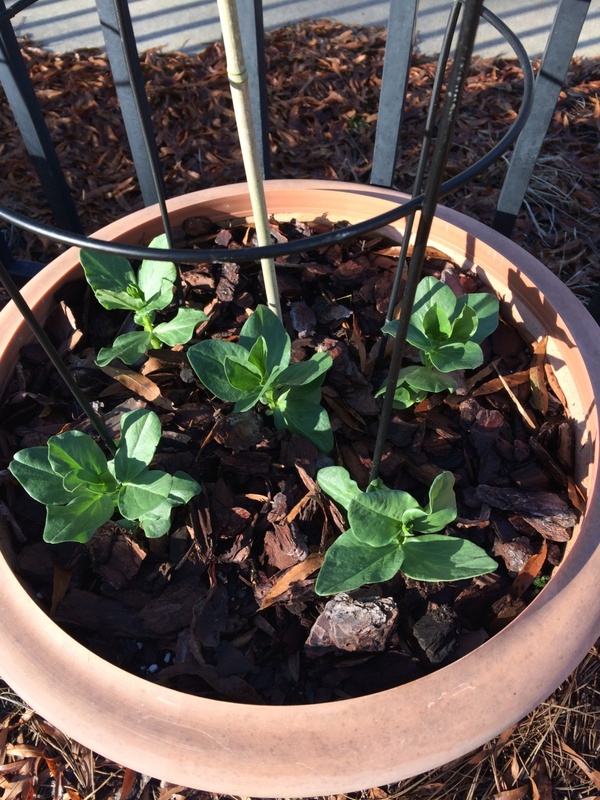 I will dig it under in Jan to be ready to plant my potatoes in Feb.
Fava Beans planted in a 2' x 20' bed and three pots. 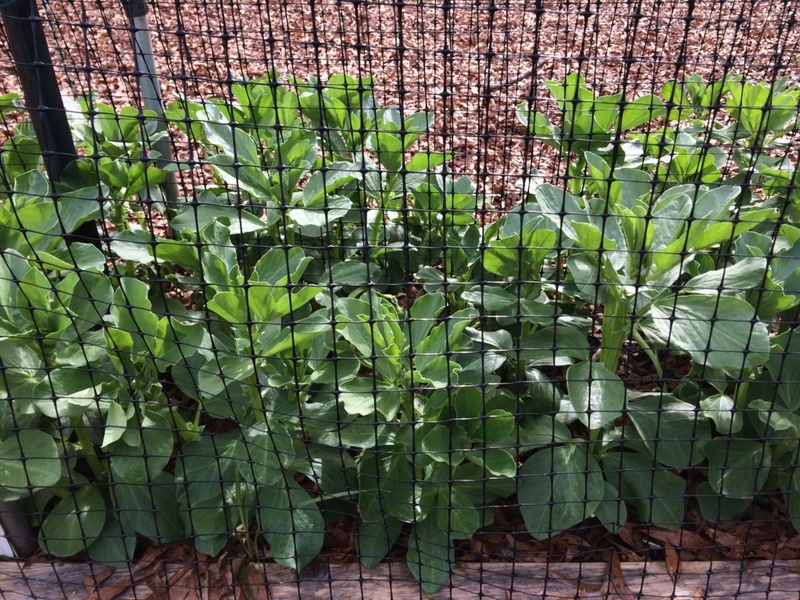 Alaska Shell Peas - because of the hot weather, these were planted later than normal. The vines are doing good but every time we get a freeze, the pods and flowers die so I have not harvested any as of now. Even in the winter, your garden is beautiful. 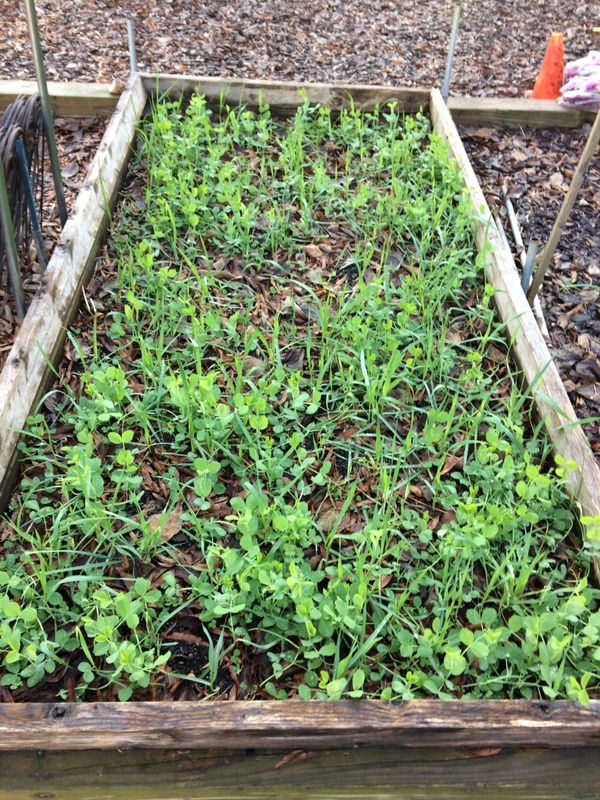 The Strike peas you gave me are out-producing the Alaska peas like 2 or 3 to 1. 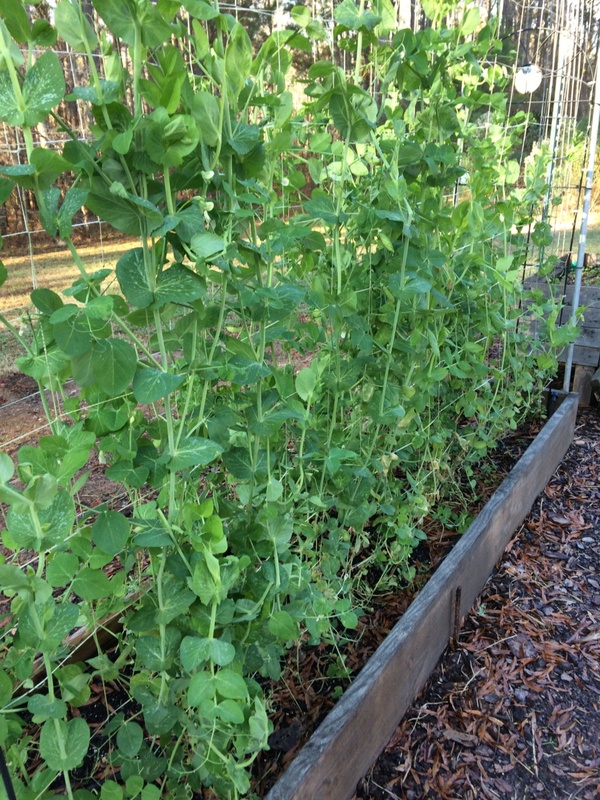 Strike peas are perfect for harvesting in my TT beds that are 2' tall - perfect growing height. Do you remember the company from which you first purchased the seeds? Oh, and yes, they do like to lay down so trellising is helpful. @sanderson wrote: Even in the winter, your garden is beautiful. Thank you about the beautiful garden. We got 3 inches of rain last night so the aisles are swimming. This is the first time in 6 years that I have ever had standing water in my aisles. Yes, I bought the Strike Peas from Johnny's. I had a lot of strike peas on the plants this season also. But I was sick for three weeks back in late Nov early Dec and did not get to harvest my peas. I just turned under the plants to enrich the soil so they were not wasted. Yes, I always but a short fence between the rows to keep them growing upright. I'll have to remember Johnny's when I order seeds next month. I'm still searching for Snow Fairy tomato seeds. I'm wondering if the grower had a bad year. I spent this weekend breaking down and rebuilding my compost pile. 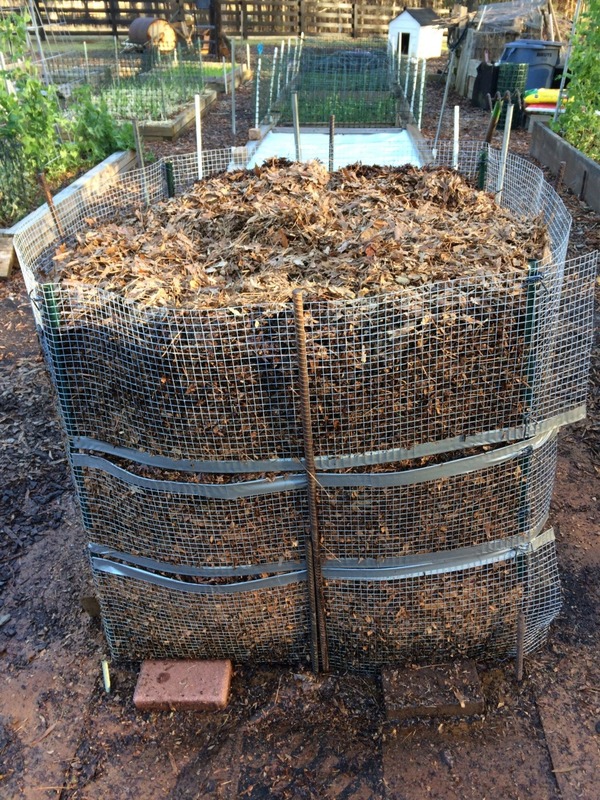 I used the Sanderson old method of shoveling out the compost from the bin onto a tarp. Then shoveled it back into the bin and added some nitrogen products to try to get it to heat up again. I added 10 gallons of used coffee grounds and 5 gallons of shredded coffee filters. I also had a lot of things that were high in nitrogen that have been sitting on a shelf for years. So I also added 3 cups of blood meal, 1.5 cups of kelp meal, 1.5 cups of cottonseed meal, 1.5 cups of Dr Earth Organic fertilizer with microbes, 1.5 cups of Plantone fertilizer with microbes, 1.5 cups compost maker, 6 cups of crushed alfalfa pellets, 3 shovels of soil from the woods with microbes hopefully. This should heat it up and hopefully will not be too much nitrogen. 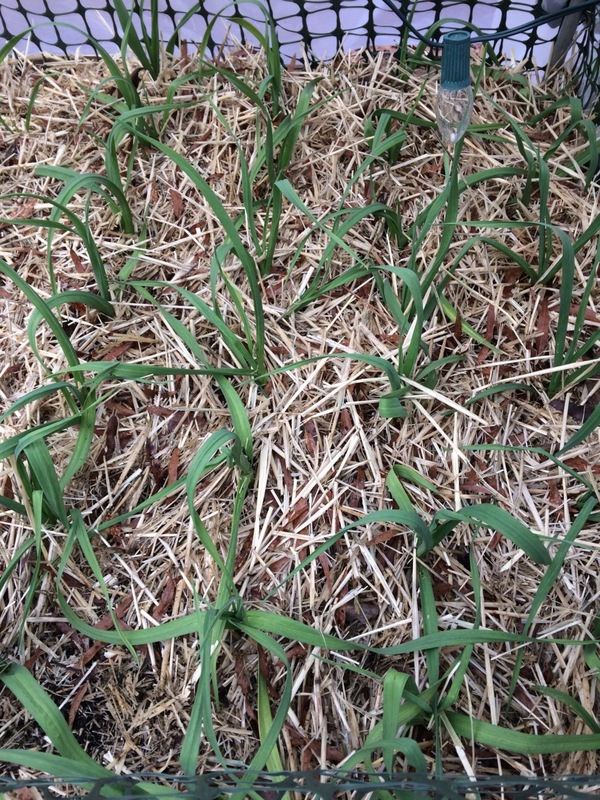 I have never added fertilizer to a compost pile but these two types of fertilizers have microbes in the fertilizer which may (or not) be helpful. How many cubic yards of compost is that? 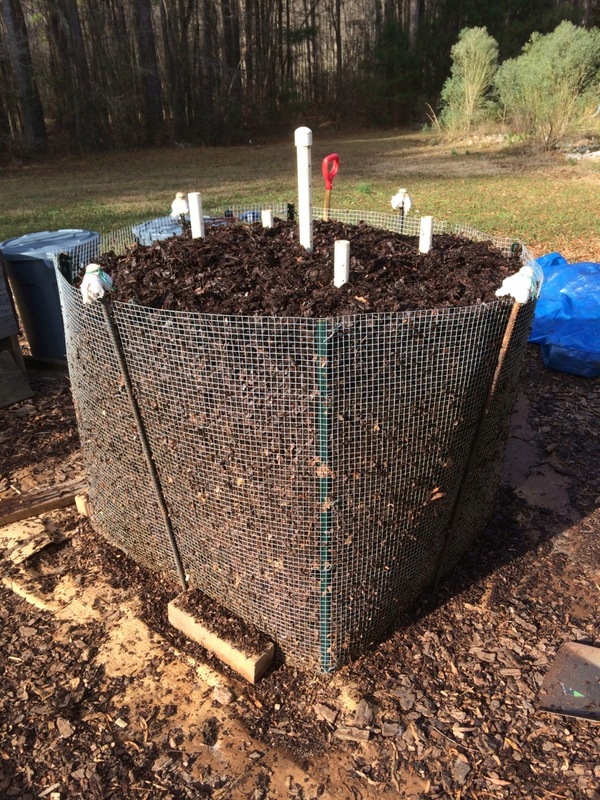 When I used the 3'x3'x3' bin, I added 1 cup of blood meal distributed between several layers. With what you added, you should be able to heat it back up. There were a few times when the temps reached up to 170*F and I had to quickly take it all out for a bit to cool, then fork it all back in. 37 cubic feet. 3.5 x 3.5 x 3. Wow! How is your back today? sanderson, you had me intrigued with the Snow Fairy tomato. I talked to a representative from Johnny's Selected Seed today and actually took home their catalog, I usually only look at seed packets online. The Snow Fairy tomato is not listed in the catalog and not really available but she might be able to find some. I have her card in my bag if you are still interested, I could send you the contact information in a P.M.. I did get a packet of Yellow Beet seeds for free which I will probably grow out. I was at the Ct. Vegetable and Fruit Growers Conference today and I remember you had mentioned Johnny's and Snow Fairy. I also checked Baker Creek and they don't have it either. they bought Comstock Ferre Seed Co. and have their line of seeds in that store in Wethersfield, basically across the river from me. I am going to focus on the tomato seeds I got from Rutger's University, The Rutger's 250 and a Campbell variety. 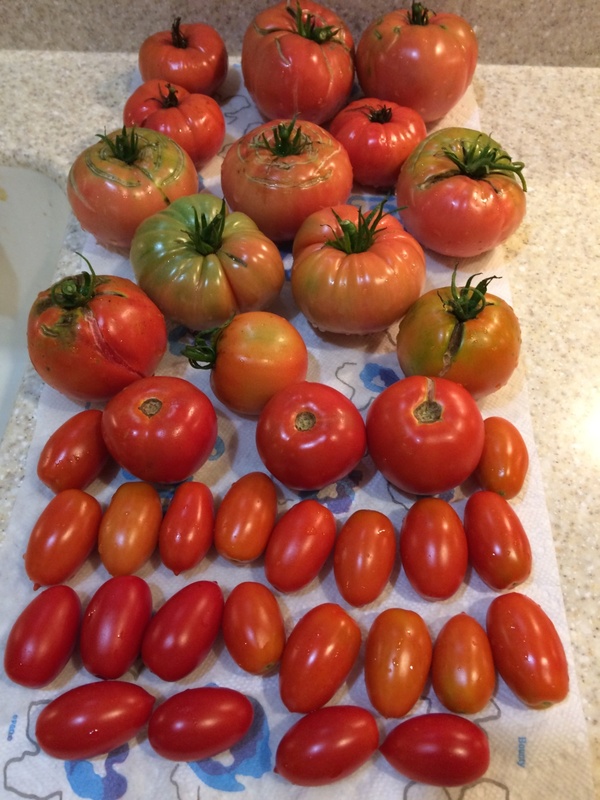 I do like the Romas because I like them roasted green with feta and as the primary tomato in my varietal marinara sauce. I have another 10 to 15 varieties, I like to grow out for seed and some because their flavor reminds me of bygone days. I had a blast today as I also got a free packet of pumpkin seeds from New England Seed. For some reason most of the presentations were about growing different fruits and vegetables in high tunnels but one of the last ones was about nutrients for tomato production in a high tunnel with potassium being the focus and yellow shoulder being the problem. Picked up a few tidbits of information, one being 10 hours of daylight signals grow time for high tunnels. @sanderson wrote: How many cubic yards of compost is that? 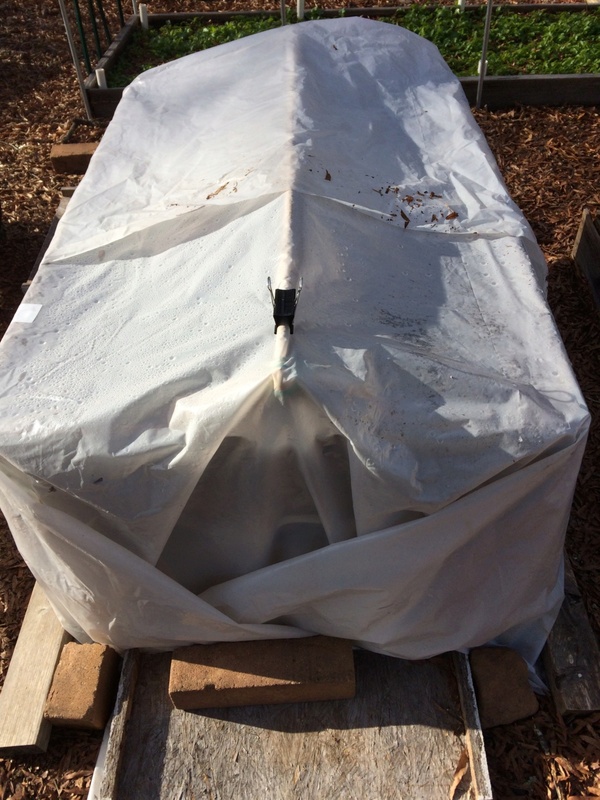 When I used the 3'x3'x3' bin, I added 1 cup of blood meal distributed between several layers. With what you added, you should be able to heat it back up. You were able to reach those high temps with 1 cup blood meal in your 3x3x3 bin when you restarted it??? Wow. Hope I did not add too much nitrogen. We shall see. Worked on my Garlic bed the last couple of days. Removed the soggy wet wheat straw that was on the bed acting as mulch. I let it sit in the sun a couple of days and it dried out some. Then I fertilized the garlic and covered again with straw. 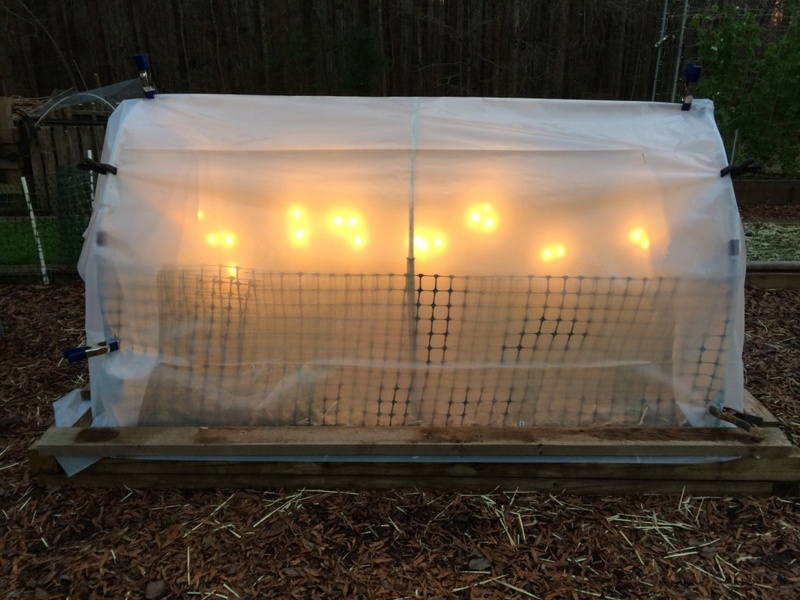 Set up a hoop house and added some old time heat producing Christmas lights. 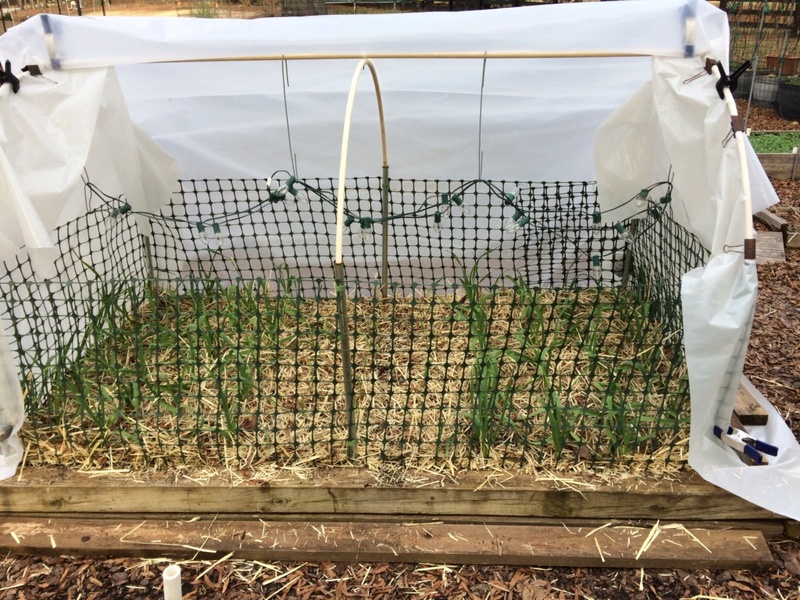 The garlic probably does not need the hoop house or lights but I had them and decided to set them up. @yolos wrote: . . . You were able to reach those high temps with 1 cup blood meal in your 3x3x3 bin when you restarted it??? Wow. Hope I did not add too much nitrogen. We shall see. I don't think I ever used blood meal to restart a fizzled bin. I did use it to start up new bin composts. Your garlic look so nice and cozy. The bottom of my garlic bed fell down. The bed is one of my son's with pressed fiber board for the bottom and, thank goodness, was only elevated on 2" wheels. However, it will be difficult to keep it watered until July with only commercial weed fabric for the bottom 2". @yolos wrote: I spent this weekend breaking down and rebuilding my compost pile. I used the Sanderson old method of shoveling out the compost from the bin onto a tarp. Then shoveled it back into the bin and added some nitrogen products to try to get it to heat up again. 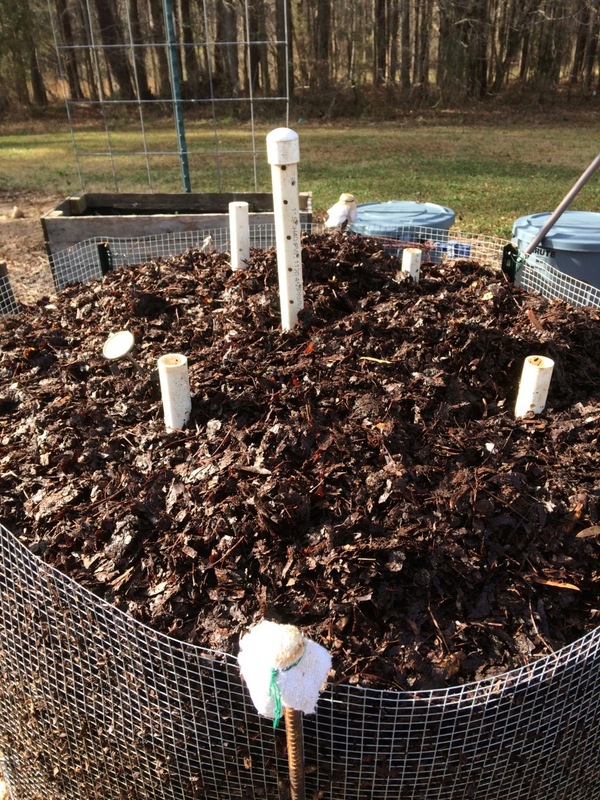 I added 10 gallons of used coffee grounds and 5 gallons of shredded coffee filters. I also had a lot of things that were high in nitrogen that have been sitting on a shelf for years. So I also added 3 cups of blood meal, 1.5 cups of kelp meal, 1.5 cups of cottonseed meal, 1.5 cups of Dr Earth Organic fertilizer with microbes, 1.5 cups of Plantone fertilizer with microbes, 1.5 cups compost maker, 6 cups of crushed alfalfa pellets, 3 shovels of soil from the woods with microbes hopefully. This should heat it up and hopefully will not be too much nitrogen. 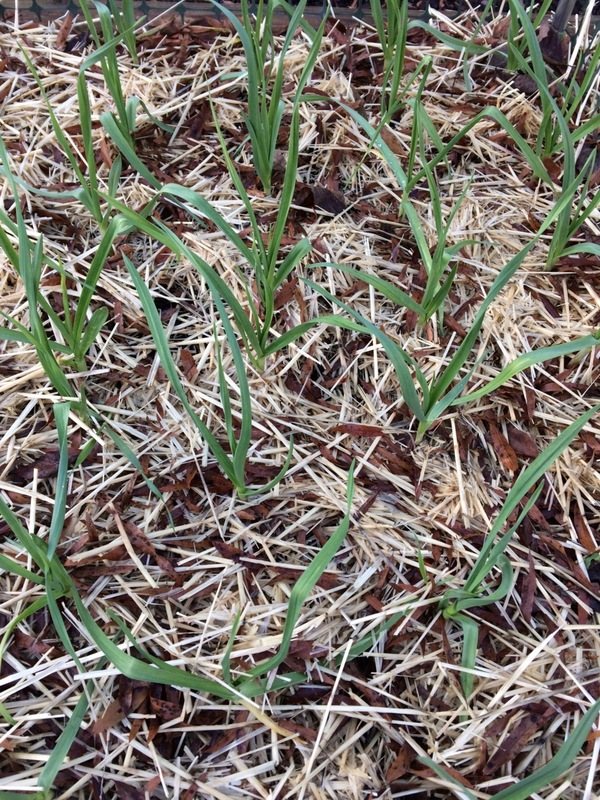 I have never added fertilizer to a compost pile but these two types of fertilizers have microbes in the fertilizer which may (or not) be helpful. holy crud! I haven't done that in years! And I don't see myself doing it anytime soon. Good on you, yolo's! Great exercise for the middle of winter. My latest tumbler compost fizzled and looked quite wet. We added alfalfa pellets over a couple days. It really helped absorb a lot of the moisture and the temp rose to 140*F. It's fizzled again. I think the rain gets into the tumbler so I will wait until March or April to start another. 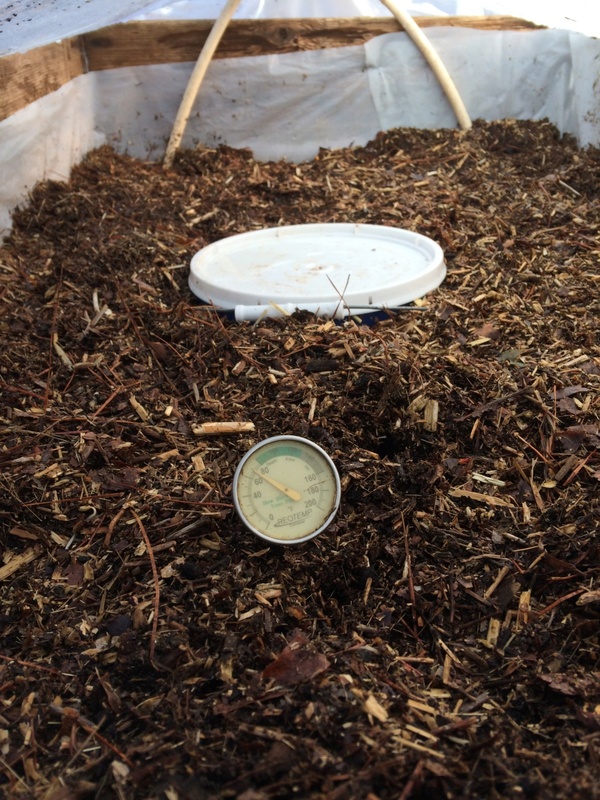 I completed my current compost pile (3.5 x 3.5 x 3)on 12/18. The temp got up to 120*F. On 1/6 the temp had decreased to 100*F and I dumped all of the compost out and added a lot of nitrogen to the pile. It reheated to 130*F. Now it is back down to 100*F. So I will have to decide whether to break it down again and give it some oxygen. I think there is plenty of nitrogen in there but who knows. We are having long stretches of sub freezing weather at night and I am not used to the prolonged cold weather. Just up-potted my spinach starts. I presprouted the seeds in damp paper towels and then planted multiple sprouted seeds into each cell in a 36 cell tray. 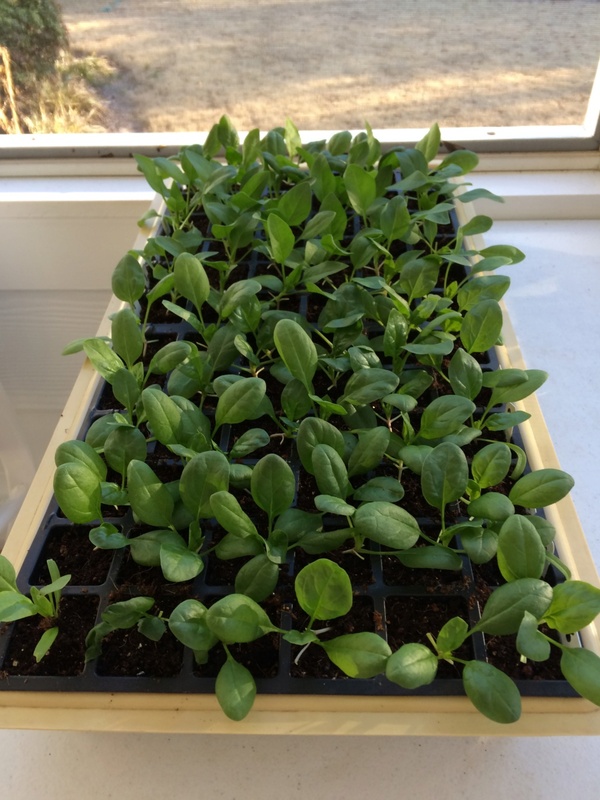 I just divided the seedlings and planted them individually into a 72 cell tray. If they all make the transplant, I will have a lot of spinach (hopefully they will not bolt early). I plan on planting them out the middle of Feb so I should get some harvest-able leaves before they bolt. They have sun for about 4 hours in the porch and then I bring them inside under T-8 lights. I have been working a lot in my garden over the last month. Here are a few pictures of my work. My latest compost bin. A 3.5 x 3.5 x 3 foot bin. Finished making it 12/18, after it cooled I turned it over on 1/6 and added nitrogen. It heated up a little and then cooled down. I turned it again and did not add any additional nitrogen. I did add five vertical pipes with holes drilled in the pipes to try to get air to the inside of the pile. It did not do any good because the temp never raised above 100*F.
Made an outdoor worm bin using worms collected from various bins. I added shredded twigs trimmed from shrubs, coffee, shredded corn stalks, green leaves from trimmed shrubs, etc. I added just enough greens to get the box to heat up a little. I used a bucket like Haas has been using for the food and worms. I also added a cover to be able to keep too much water from flooding the bin. I continued dismantling beds and removing MM on an aisle of twelve 2' x 2' beds. They were built in 2012 and were found to be overrun with Southern Blight. This is a soil borne disease which takes 3-5 years of non use to get rid of the disease. I let this aisle sit empty for almost 3 years. Decided to remove the beds which were decomposing and throw out the contaminated MM. 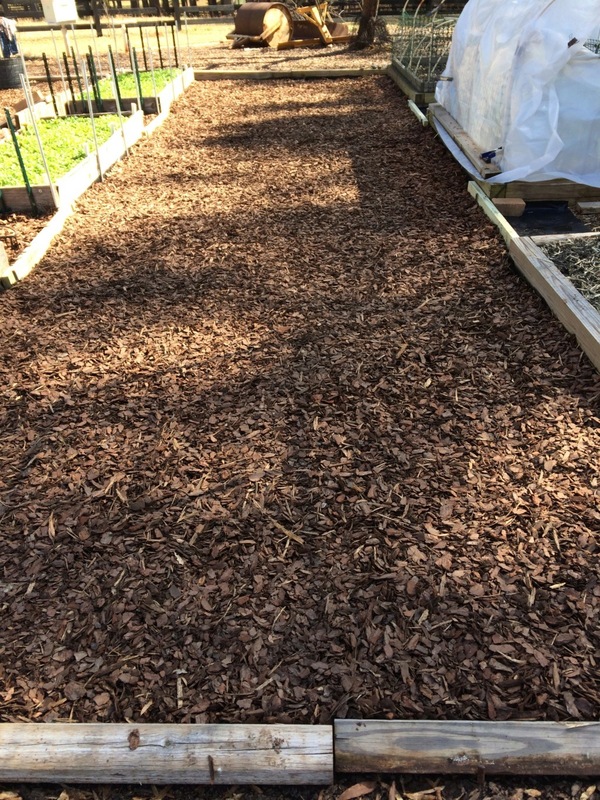 I then laid down black 6 mil plastic over the area and covered that with mini pine bark wood chips. The area is 8 feet by 32 feet. I will build 3 more 2'x8'x12" beds to put in this aisle. 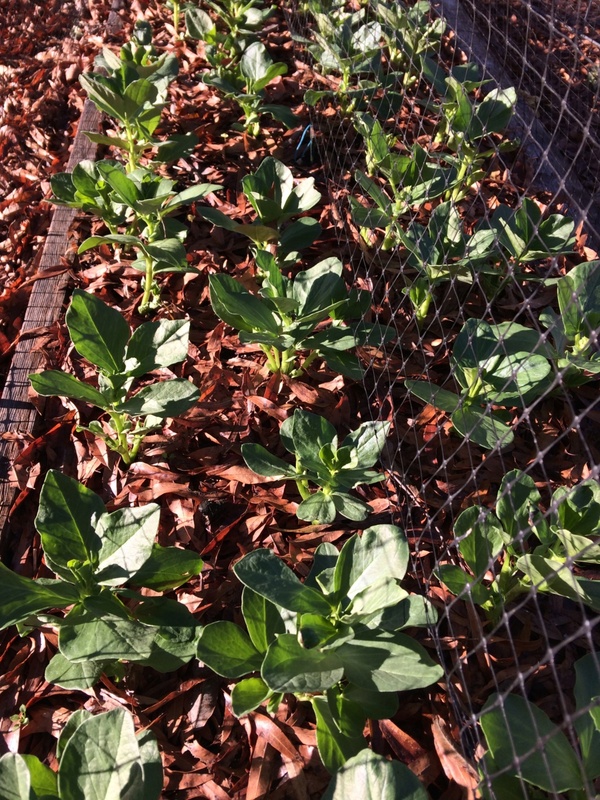 Fava Beans planted last Nov. I saw the first flowers today so hopefully we will not get another hard freeze before they start producing pods. Garlic - Early Italian planted last Nov. 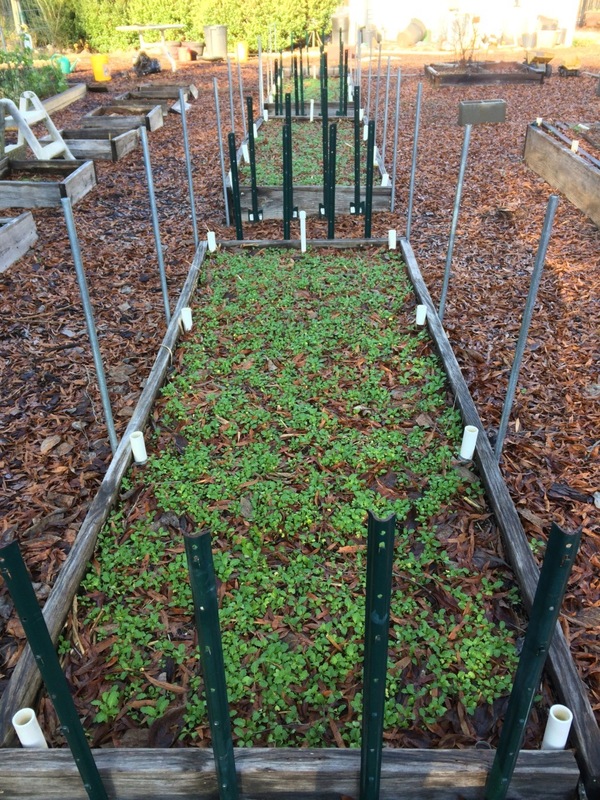 Planted a 4 x 8 bed dedicated to garlic. 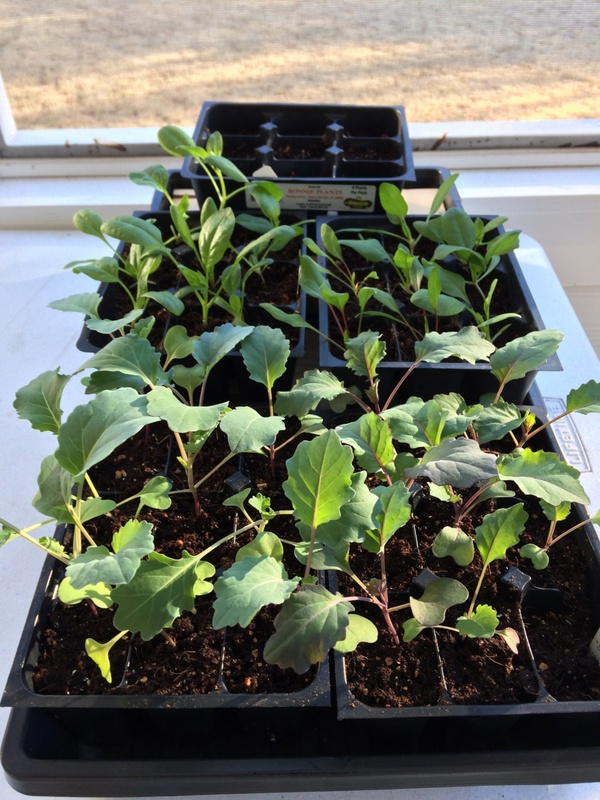 Kohlrabi (white and purple) sowed in seed starter trays on 1/17. Also a few spinach and celery in the back tray. Mustard planted last fall in various beds to help control the Southern Blight problem in these beds. I use these for corn which is impervious to the Southern Blight. 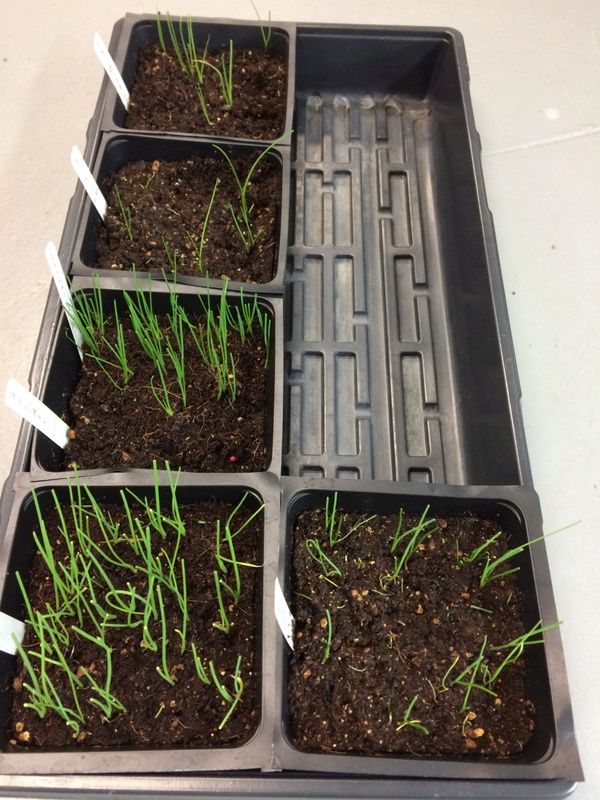 Onions and leeks sown on 1/17. These were old seeds so I had spotty germination. 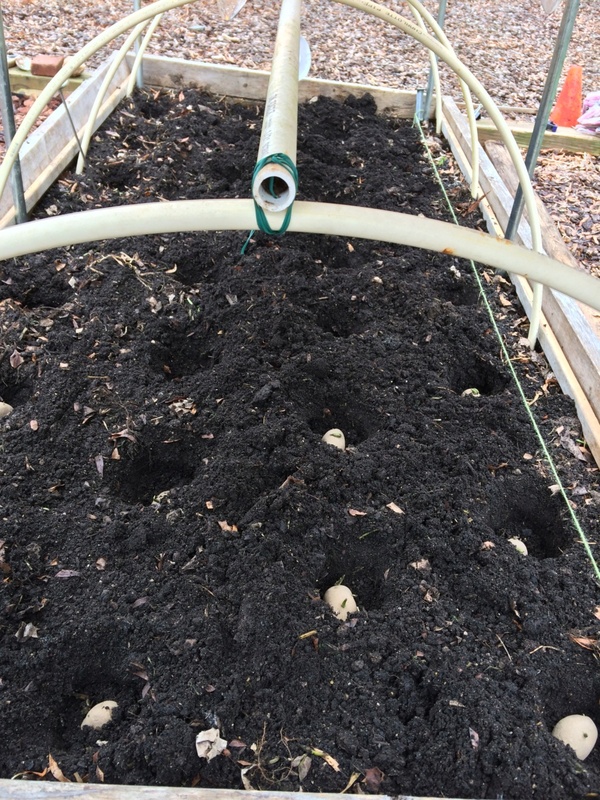 Potato bed planted with Russet Norkotah white potatoes on 2/11. I spaced them 12 inches apart and planted them 4 weeks early in an attempt to grow large baking potatoes. I also presprouted them, and let the cut sides heal a few days before planting. I am using various methods to keep the tops from freezing (Agribon 19 on very low hoops, then 4 mil plastic above that and Christmas lights to add a very small amount of heat). 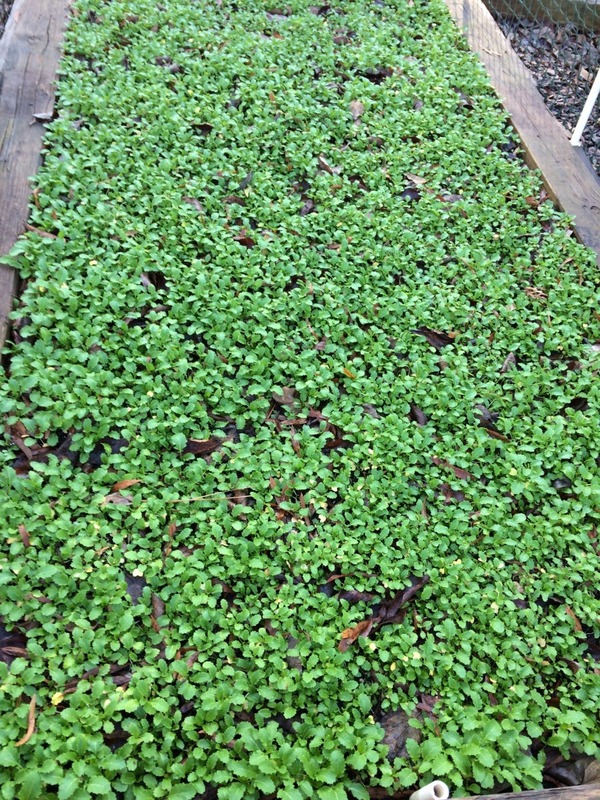 Spinach sowed in seed starter trays on 1/17. They need to be transplanted now but I have not yet added the new 2x8 beds so I may have to find somewhere else to plant them. 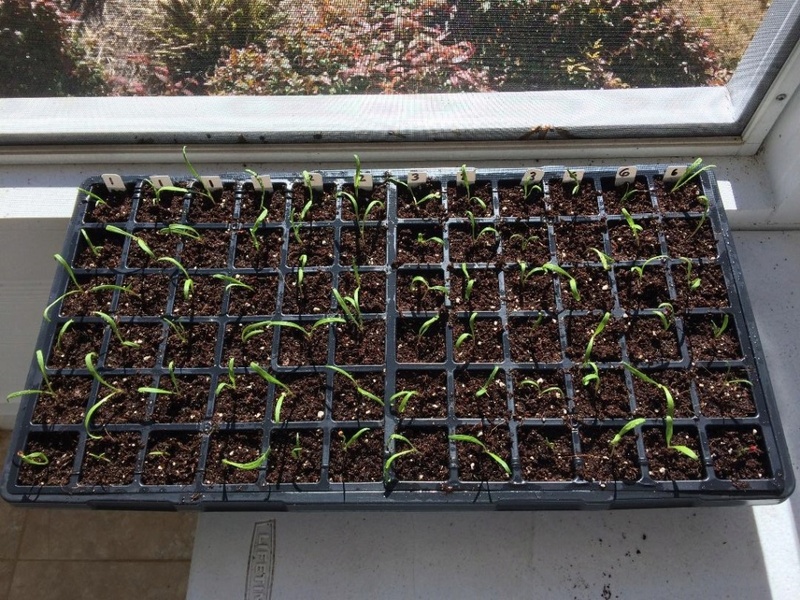 I have also planted peas and tomatoes and peppers in seed starter trays but they have not yet emerged. GoodNESS you've been busy!! And it looks great! Yolos, amazing garden! You have definitely accomplished a lot. The unfinished compost will make great mulch, at least. PS: should the name of this thread be changed to "SFG in Brooks, GA"? @sanderson wrote: Yolos, amazing garden! You have definitely accomplished a lot. The unfinished compost will make great mulch, at least. Shoot - I guess I forgot to start a new thread for 2019. So I guess you could change it to "2018/2019 SFG in Brooks, GA".